Under the guidance of Cook County (IL) Forest Preserve naturalist Sara Rose, Oak Park Friends in 2009 converted a 12’ x 14’ plot in front of Trailside Museum of Natural History in River Forest, IL to herbaceous native perennial plants. 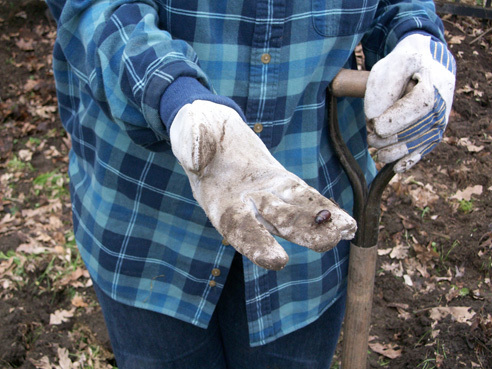 This stewardship project is intended to help conservation efforts in Cook County and teach gardening and conservation skills to local visitors. To kick the project off, four Oak Park Friends completed a seed starting workshop in January 2009 at Trailside Museum, and started seeds (previously locally collected by Ms. Rose) for six varieties of native plants. 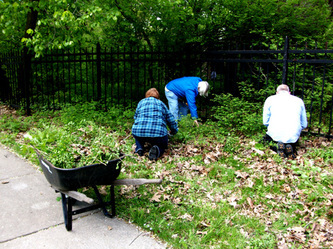 Members of Oak Park Monthly Meeting (OPMM) picked up shovels in mid-2009 to begin a sustainable garden of herbaceous perennials on the grounds of the Thatcher Woods Trailside Museum. Why native plants? There are many reasons, including providing habitat for butterflies, bees and birds; reducing the maintenance needs of the existing plot (turf grass requires time and energy to run lawnmowers, as well as water and chemical “inputs” to remain healthy); and providing a “teaching garden” for our local suburban community. Native plant gardens are low-maintenance once they get started, and help to conserve water in two ways: first, by slowing the flow of rain after it hits the ground, giving water time to percolate deep into the soil rather than adding to "runoff" which burdens wastewater systems; and second, because native Northern Illinois plants are typically deep-rooted and can therefore sustain themselves from moisture in the ground, requiring little or no additional watering once they are established. Additional volunteers spent roughly 14 person-hours turning the site in early May, breaking up sod and clearing away brush and stones. Rather than trucking away the sod, gardeners covered most grass and weeds with a layer of earth, composting them naturally and avoiding the need for weed-killers or extensive weeding. Re-digging, planting and fencing followed in June and July, with plant materials purchased, grown from seed, and/or donated by Good Earth Greenhouse in River Forest. Varieties planted in the stewardship garden include Echinacea pallida (pale coneflower); petalostemum purpurea (purple prairie clover); amorpha canescens (leadplant); and filipendula rubra (Queen of the Prairie). A generous matching mini-grant from Quaker Earthcare Witness assisted in purchase of supplies and plants, while Cook County Forest Preserve provided wood chips for mulch; design; some labor; and logistics. Oak Park Friends’ garden will add beauty and color to the Trailside Museum property, and—being native—will attract and sustain local bird and insect species as well.